The Regent Parakeet or Regent Parrot is known as the very best flier of all the Australian Parakeets. Needless to say, they are very lively and active little birds! This Australian parakeet has wonderful colors and is a beauty to look at. It is also a very fine companion. The Regent Parakeet quickly becomes trusting and agreeable and is easily tamed. It is a relatively quiet bird and when it does speak, it has a pleasant voice. Not only is the Regent Parakeet a very skillful flyer, it is an active bird and will love to play, climb, chew, and very possibly follow you around the house like 'Sid' does! This bird is also very hardy, very resistant to disease, and is not difficult to feed and care for. The nature of the Regent Parakeet is peaceful and social and they do very well in an aviary. They can be kept with other more agreeable birds such as Suberb Parakeets, Princess Parrots, and Indian Ringnecks as well as doves and quails. Dr. Jungle thinks 'Sid' is a fine example of this energetic little parakeet!... here's what Jaspal has to say about 'Sid'! Distribution: The Regent Parakeet or Regent Parrot is found in southwestern Australia and in a smaller area in southeastern Australia. They inhabit woodlands, especially eucalyptus groves, dense bushy areas, and today the birds from the western part are also found in cultivated areas, though this is not true of the birds in the eastern part. Description: This bird is most commonly known as the Regent Parakeet or Regent Parrot, but it is also referred to as the Rock Pebbler as well as the Black-tailed Parakeet, the Smoker, and the Marlock Parakeet. It has been noted that the birds from the eastern part of Australia are more colorful than those in the western area. The males have a general yellow plumage with an olive-yellow crown and nape, while the female is predominantly a more olive-green with a dull olive-yellow on the head and breast. The back on both sexes is a dark olive green and there is a red band across the middle of the wings. The outer feathers of the wings are bluish-black and yellow underneath. The tail is also a blue-black, but the female has the dull olive-green feathers underneath tipped with a rose-pink and the edges are marginated. The beak is a coral color and the legs are gray. They reach a length of 16" (40cm). They are a rather long lived parakeet and have been know to live for up to 25 years in captivity. The juveniles are similar to the females though the young males will be more yellow. They will get their full coloration at about 14 months of age. Care and Feeding: Fresh food and water must be provided daily. In the wild the Regent Parakeet eats a variety of seeds, nuts, fruits, berries, leaf buds, nectar, and blossoms. They do like to feed on the ground. Housing: A single bird can be kept indoors. A roomy cage is required, and time out of the cage for exercise and flying is very important for them. They will also do very well in an aviary kept in groups of two or three pairs or with a mix of other peaceable birds. They do not like to bathe in a dish but do appreciate a spray bathe. Social Behaviors: In the wild these birds live in pairs or small flocks of about 20 birds, though they have been seen in flocks of up to 100 birds. They have a pleasant nature and enjoy being housed with other birds. Some good choices include Suberb Parakeets, Princess Parrots, and Indian Ringnecks as well as doves and quails. Handling/Training: The Regent Parakeet or Regent Parrot quickly becomes accepting and trusting. They have an agreeably social nature and are easily tamed. They are also intelligent and are good talkers. Activities: Regent Parakeets are very energetic birds! Besides flying, which is important for all parakeets, these birds love to chew! Be sure you provide them with lots of assorted toys and wood chews, perches and swings. The Regent Parakeet or Regent Parrot will readily breed and will produce one brood per year. In the wild they build their nests in large hollows down in the main stump of a tree. The female will lay four to six eggs. The young hatch in about 21 days and will fledge in about 40 days, leaving the nest in about 50 days. As importation of these beautiful birds is prohibited by the Australian government, many believe that it is important that the species are kept from cross-breeding to insure their continuation, there will be no more pure species brought into this country. However they will easily cross-breed, and have been hybridized with the Princess Parrot, the Suberb Parrot, and the Crimson-winged Parrot. Color mutations have also been achieved. 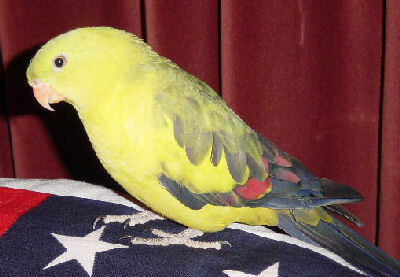 There is a red mutation in Australia and a yellow-backed variety in Europe. Though the Regent Parakeet or Regent Parrot is a healthy and hardy bird, they do forage for food on the ground. This can make them more susceptible to intestinal worms and fungal infections. These can be averted by keeping the cage or aviary well maintained and clean. Because of their frequent contact with the ground where they like to pick up seed, you may also want to talk to an avian veterinarian about a regular de-worming schedule. With a proper environment and a good balanced diet, they are very hardy and resistant to disease. Availability: Regent Parakeets or Regent Parrots are occasionally available at pet stores or from breeders. My beautiful Freddie was always green but I noticed in the past couple years her head area is turning all yellow. At first I thought it was adorable but am wondering if it is a problem? For other parrots, I am told That birds feathers turning yello could indicate liver disease but wonder if its the same thing here. Freddie is 16 years old. She gives me a hard time with food. Loves mostly pellets and has a habit of throwing food around her cage when it is not her favorite seeds. I brought her to the vet a few years ago when it started happening and they did blood work and said she was fine but the yellowing is more prominent now and I wonder. Freddie is a girl. Thanks for weighing in. I have a male Regent/Rock Pebbler that I bought over 25 years ago from a local pet store in Southern California. He's very talkative and social. It's funny that the article stated, 'They do not like to bathe in a dish but do appreciate a spray bathe.' I had to finally replace his cage with a stainless steel cage because he took a bath in any and every dish along with the sink or shower. I also found he didn't care much for a spray bath. I guess that was individual preference. The last couple of years he doesn't want to be out of his cage much and he is sleeping a bit, but at 25+ years I guess that's to be expected. Even though he talks, he's quiet most of the time and doesn't chew like other parrots I have had in the past. He has his favorite person with me, but will go to anyone without a problem. The only thing I have found is that he doesn't like to be pet or cuddled, never has. Other than that, he has been a great bird. What a great bird! And thanks for sharing his bathing behaviors. Each bird is unique, so you just never know for sure what an individual will do! Great info. I have to agree. I found the bathing in the dish part funny as mine loves to take a bath in it every time she goes in there. I give her an actual shower in the bathroom and then when she is all dried up, she gets back to her bowl to take another bath. She loves water. Not sure where you are but I bought mine years ago at an avian pet store and she was $500. She is now 16 years old. I go often to get her groomed and to buy food and I don’t see them selling them. Was told that they are hard to get. I live in the US. They are hard to find here but can me found occasionally. My Freddie is a sweetheart. My husband and I have 2 male Rock Pebblers (Regent Parrots) and they are so loving. We also have Quakers and parakeets, budgies, and doves.. I have to say that our Rock Pebblers are our favorites. They are our babies! We would like to find a female for a companion. However they are very hard to find. If anyone knows where there are any females for sale, Please let us know... my husband takes them out in the back yard every morning and every evening, (their wings have been clipped) and they have the best time. They are very entertaining birds who love us just as much as we love them..
if still interested, let me know. Hello ... pls let me know if you are still interested in breeding. I have a 3 year old female and 2 year old male. I will sell them together. I live in southern California. Thank you. Hello, I live in Marysville Wash. I have a female Rock Pebbler that I would like to sell her name is Olive and I have had her for 4 years, where do you live? Thefinchfarm.com sells them for a little over 600. I have bought birds from them and found them to be completely reputable. I have a female `rock pebbler. I never could find a male. She is so cute. My bird just passed away from cancer. He was only three years old and my girlfriend is devastated. I'm looking to purchase another one for her I can't seem to locate one. If you are still looking, I can help.